Summary: Microsoft Scripting Guy, Ed Wilson, talks about how to configure Windows PowerShell memory availability for specialized applications. Hey, Scripting Guy! I really need your help. We are doing something that perhaps Windows PowerShell cannot do. At least, this is the way it seems. We have a huge file share, and we are parsing through it with a series of Select-String commands to find specific types of things. We are using Get-ChildItem to obtain files for us to parse, and we have filtered it out as much as is possible. The thing is, that when I say huge, I mean really, really huge. Absolutely GINORMOUS type of huge. Anyway, we are perfectly resigned to the fact that Windows PowerShell will take some time to go through this parsing effort, and we have obviously tested everything on mock (much smaller) data prior to turning this thing loose. The problem is that Windows PowerShell runs for an hour or so, and then it stops with a System.OutOfMemoryException error message. It is bad enough that it happens, but it is horrible that it takes so long to occur. We make changes, reboot the server, wait for another hour, and boom!—it happens again. We have spent an entire week trying to make this work, and you are our last hope. I searched the Hey, Scripting Guy! blog, but I did not find anything helpful. So now’s your chance to be a real hero. Microsoft Scripting Guy, Ed Wilson, is here. Today is a great day. I got up, and fixed some nice English Breakfast tea with a bit of organic orange rind, some peppermint and spearmint leaves, a bit of crushed cinnamon stick, and a touch of lemon grass. I must say, it is a very refreshing cup of tea. Yesterday I had an awesome session with my mentee, Ashley McGlone. I am real proud of everything he has accomplished so far. So the week is going along perfectly. I am looking forward to this Thursday (August 1, 2013). We are having the Windows PowerShell User Group meeting in Charlotte, North Carolina. It will be awesome. With everything moving along smoothly, I thought I would take some time to try to catch up a bit with questions such as yours that are emailed to scripter@microsoft.com. Running WinHttpAutoProx… WinHTTP Web Proxy Auto-Discovery Se..
Running WinRM Windows Remote Management (WS-Manag..
Just for fun, I close the Windows PowerShell console, and then reopen it. I rerun my Get-Item commands to see if anything has reverted. As indicated in the image that follows, everything is groovy. 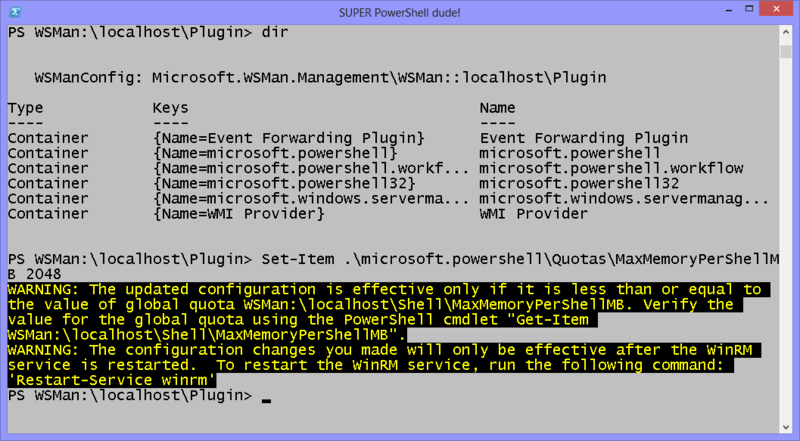 AP, that is all there is to using the WSMAN drive to configure Windows PowerShell memory. Join me tomorrow when I will talk about more cool stuff.